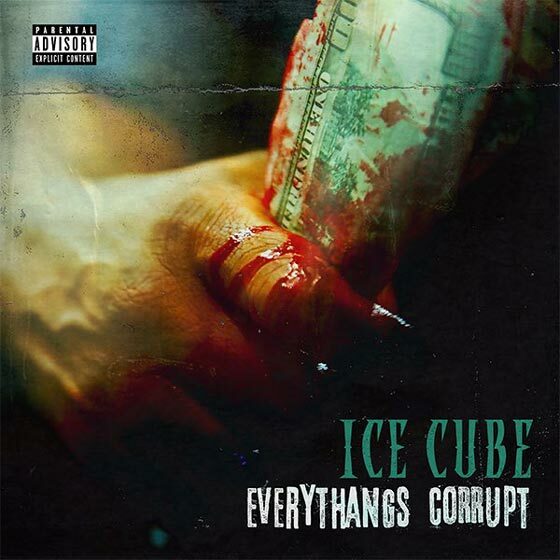 Between his work in film and his BIG3 basketball league, Ice Cube has seemingly had little time to get in the studio to finish off his long-awaited LP Everythang's Corrupt. However, the arrival of album art could mean the effort's release is closer than we think. On Twitter, Cube shared the artwork you see above, which features a bloody fist tightly clenched around an American $100 bill. Cube captioned the post "Winter is coming..."
Earlier this week, a fan on Twitter asked Cube about the album's status, referencing a first single drop that was expected to happen this summer. Cube replied that he is now "shooting for November" for the single release. Ice Cube first announced Everythang's Corrupt back in 2012, releasing the title track and an accompanying video on the eve of the 2012 United States presidential election. He followed that up with a second single titled "Crowded" in 2013. In January of 2014, Cube set a May release date for the album that ultimately never came to fruition. A third single titled "Sic Them Youngins On 'Em' arrived in February that same year. In 2016, Cube told AllHipHop that the album had been delayed due to his recent ventures in film. "I had to put it down for a minute to finish these movies and make sure they were right," he said. "To make sure Ride Along 2 was right, Barbershop and Straight Outta Compton...I just didn't want to spread myself too thin. Finish these movies and finish this promotion and then finish the record and put it out." Ice Cube's last studio album was 2010's I Am the West.